Tendril (noun): a slender threadlike appendage of a climbing plant, often growing in a spiral form, that stretches out and twines around any suitable support. In High Park, the most common plant with tendrils is wild grape. Tendrils find suitable hosts by touch. Tendrils are especially noticeable in winter when they form unique shapes against the snow or sky. The word tendril comes from the Old French word "tendron", meaning "young shoot", which derives from the Latin word "tener", meaning "tender". 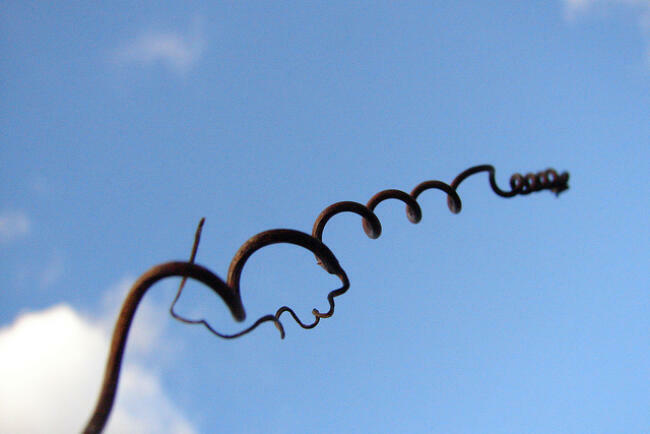 A wild grape tendril that was unable to find something to twine around.